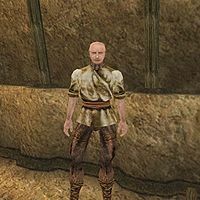 Ennbjof is a fatally ill Nord commoner who can be found in The Lizard's Head tavern in the Telvanni canton in Vivec. Before he leaves Morrowind to die of mazte-poisoning in his homeland, Skyrim, he wants one more bottle of mazte and a drinking companion to talk to about an ancient Nordic burial chamber. He is wearing a common shirt with matching pants, shoes and belt. Aside from his natural resistance to shock, immunity to frost, ability to shield himself, and a natural frost damage spell, he knows no spells. "Eh, there, kipper? Buy an old reaver a jug of mazte, tell you a little secret?" "Can you spare a jug of mazte for an [sic] tired old sea reaver?" "Gods be with you, %PCName. And thanks for the mazte."